It has been a while since I last wrote about Piitu and her second day in dog school. She is doing very well there an she started the second level this week. She has a great desire to please people and that makes her an excellent learner. 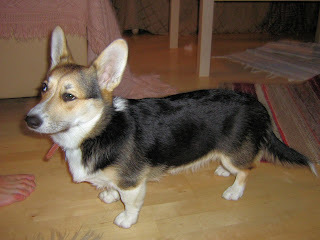 She is full of energy and does things I never thought that Corgis would do. I have had one in the past but Piitu is totally different. And I thought Ellu was wild. I actually knew nothing! Piitu watches TV sometimes and sees herself in the mirror. I have not yet figured out what kind of programs she prefers. She does not have time to watch TV very often. Ellu used to eat every bit of food we ever gave her and additionally she stole sandwiches which were left too near the edge of a table. Even though a Corgi has very short legs it has a long body and it can reach the table by jumping to lean on the edge of the table. Piitu is not that hungry. She does not necessarily want to eat when we offer her food. I think that is good since Corgis get overweight very easily. Piitu also doesn't eat her chewing bones when we give them to her. She hides them, either in the garden or under the furniture. She has many times come from outside with a dirty bone she has dug from it's temporary storing place. Now she is practicing on jumping. For a long time she has been able to jump on the sofa and the bed. Two days ago I was working in the living room with my laptop and the door to the garden was open. Suddenly I heard an odd sound from the outside. When I went to see what had caused it, I found Piitu standing on a box we have for gardening tools. The box is actually very high. It's a bit higher than Piitu's own length if we don't count the tail. Yesterday I was again working when I heard something strange, this time from the kitchen. When I went to check that one, I found Piitu on the kitchen table. She had used the chairs as her stepping stones. And I had thought they were too narrow for her to jump on! We are going to take Piitu to agility practice. I hope she will get enough jumping there to need to do that at home any more. Piitu has obviously musical talents also. We have almost all of the Singstars for PS2 and when children come over, we take battles with each other. Piitu joins us because in her opinion the children don't visit often enough. When the song has those la-la-la, da-da-da -parts, Piitu starts barking. Otherwise she does not bark often. Maybe we are not as good in singing as we think we are. What an adorable doggy. Piitu does sound amazing. That is awesome! You have a great corgi :) Thanks for the link!